Friday the 13th ~ 2nd in a Row!! So if Friday the 13th is considered a bad luck day, what happens when we have TWO Friday the 13th’s in a row? Crazy bad luck, or do they cancel each other out? 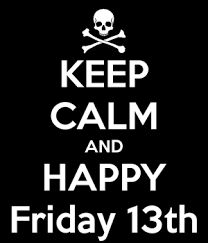 Of course, this isn’t a worldwide phenomenon, in Spain, Tuesday the 13th is the bad luck day, and in Italy, Friday the 17th is the day to avoid walking under ladders and breaking mirrors. Or is that everyday bad luck, that and letting black cats cross your path? Can you tell I’m a bit confused?! I can’t think of anything in particular that has happened to me on this bad luck day, but then again I don’t really tend to put much stock in ESP, fortune telling, signs of the zodiac or tarot cards. Ghosts on the other hand, now those suckers are real…we have one or two at home! And don’t worry, if you manage to get through today without any mishaps, we have another Friday the 13th coming up in November!